On December 17, 2014, President Obama announced the easement of travel restrictions to Cuba for Americans. Although the change was highly publicized, many of its nuances were not. 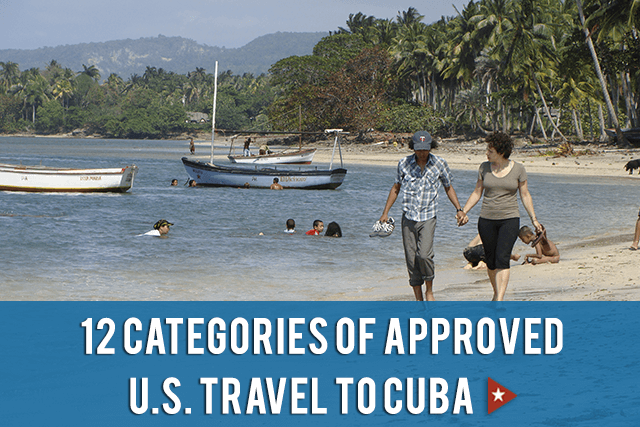 Trips that once required a “specific license” are now authorized by a “general license,” which means that people who meet any of the 12 criteria listed below do not need to apply for a license to visit Cuba. Also, the previous per diem rate no longer exists, and Americans visiting Cuba may engage in monetary transactions, such as lodging expenses and food, that pertain to travel. Americans will soon be able use credit and debit cards in Cuba. Cigar and rum aficionados will be pleased to know that travelers may return to the United States with up to $100 worth of alcohol or tobacco products (or some of each) purchased in Cuba for personal use. 1. Family travel: Americans are permitted to visit close relatives, defined as any individual related “by blood, marriage, or adoption, who is no more than three generations removed from that person or from a common ancestor with that person. 2. Official government business: Employees, contractors or grantees of the United States government, any foreign government, or any intergovernmental organization (of which the U.S. is a member or observer) can travel to Cuba on official business on behalf of their government or intergovernmental organization. 4. Professional research and meetings: This is an opportunity for people to conduct research in their fields or attend professional meetings. 5. Educational activities: Under this category, insightCuba offers people-to-people trips to those who register for one of our Cuba tours. Staff and students from academic institutions and secondary schools also are allowed to engage in certain educational activities in Cuba under this classification. 6. Religious activities: Religious organizations, members, and staff are allowed to engage in programs and religious activities. This category of travel to Cuba must consist of a full-time schedule of religious activities. 7. Public performances, clinics, workshops, exhibitions and athletic competitions: In general, this category applies to athletes, performers, and artists who plan to participate in amateur and semi-professional sports, perform publicly, attend clinics or workshops, or exhibit their work. 9. Humanitarian projects: These include medical and health-related projects; certain beneficial construction projects; environmental projects; and undertakings involving educational training (in entrepreneurship and business, civil education, journalism, advocacy and organizing, adult literacy, or vocational skills; community-based grassroots projects; projects suitable to the development of small-scale private enterprise; projects related to agricultural and rural development that promote independent activity; micro-financing projects with some exceptions; and endeavors to meet basic human needs). 11. Exportation, importation, or transmission of information or informational materials: This category allows a number of activities related to the publishing, music, and film industries. 12. Export: Travel to Cuba is permitted for some authorized export transactions. If you still have questions about any of these new restrictions and traveling to Cuba, please contact us. We look forward to seeing you in Cuba. How can I get more information regarding Educational Activities Category to go to Cuba? How would I write the report that the U.S. government requires? Can you send me some samples of what I would have to write? Thank you. Hello!I am wanting to do a two day dance workshop in Havana. Would this qualify for this visa? What will I need to do to attend this workshop?Thank you so much for your insight! Hi Angela, Thanks for your question. Without knowing what the workshop is or who is hosting it, its hard to say, but As an American traveling to Cuba you must participate in a full schedule of people-to-people activities guided by an authorized travel provider. We would recommend discussing this with whomever is hosting the workshop. thanks!